Over 18.000 products in stock ! For almost all models from different construction years. Workshop books, part books etc. Look here for our current motorcycles offer. List of available key numbers. On this website you will find the construction drawings of your engine with the correct Suzuki part numbers. Enter the requested numbers on our website and you will see our price and availability. If you do not find what you are looking for just send an email with the numbers or your question. 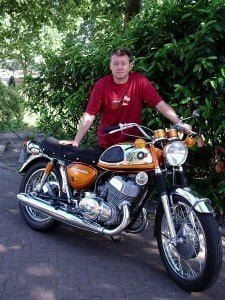 Hello, I am Marcel Vlaandere, owner of Classic Suzuki Parts NL. My company was born years ago from my predilection for these Suzuki-two characters. From the day I was eighteen years old (7-1-1982) I drove and I chose this series over the rest of the engine range. After a GT 250, T500 and GT 750 I have tried other two-wheelers for a while, but after many years I have returned to my old love: the GT 750. Hopefully we will see and speak to each other personally. In 1994 I returned to Frisian Bolsward because of other work. An old childhood friend there had a barn full of GT stuff. He wanted to redo that stock, because his interest now went to a completely different engine area. The collection was so large that after I had first taken out a private stock, I had to advertise it. As a result, I got enthusiasts from all over the country. I was repeatedly asked why there was no T and GT club in the Netherlands. According to many, given my extensive parts inventory and my contacts, I was the right person to start such a club. In 1997 I organized the first meeting as a trial. With a rise of 50 men I had long been satisfied; it was 110. As a result of this success, I founded the T and GT Lovers group, which in October 1999 was converted into a real club with about 250 members and we are still growing! In April 1999 I took the big step myself and officially registered as a motorcycle dealer. Making your work your hobby (because I still feel that way) who does not want that? I do not have any illusions about the size and duration of the T and GT trade. I am still enthusiastic about beautiful engines and parts and if I can work there for a number of years, then I will go for it. So, I hope you now have a bit of a picture of me and the origin of my company: Classic Suzuki Parts NL.